Another visit heralding the theme of the Plantagenets! Fontevraud Abbey or Fontevrault Abbey (in French: abbaye de Fontevraud) was founded by the itinerant reforming preacher Robert of Arbrissel, who had just created a new order, the Order of Fontevrault. The first permanent structures were built between 1110 and 1119. Philippa of Toulouse persuaded her husband William IX, Duke of Aquitaine to grant Robert of Abrissel land in Northern Poitou to establish a religious community dedicated to the Virgin Mary. The abbey was founded in 1100 and became a double monastery, with both monks and nuns on the same site (Source: Wikipedia). This place is situated in Saumur, Maine-et-Loire, Pays-de-la-Loire, France. In the early years the Plantagenets were great benefactors of the abbey. Two of King Henry II and his queen Eleanor of Aquitaine's children, John and Jeanne (Joan), were raised partly here, and women in the Plantagenet family often became nuns here. While Isabella d'Anjou was abbess, Eleanor became a nun here, after Henry II's death. of ongoing renovations but found it behind us upon passing this gate. Relief! This abbey church and three of the monastery’s buildings are still standing. an architectural point of view. As this class is being teached. Hands on learning about building techniques. Resounding names of medieval times. Richard I the Lion-Heart (Richard I seen above). Richard I, King of England (08Sep1157 – 06Apr1199) was King of England and ruler of the Angevin Empire from 06Jul1189, until his death in 1199. He was known as Richard the Lionheart, or Cœur de Lion, even before his accession because of his reputation as a military leader. At 16, Richard had his own command, putting down rebellions in Poitou against his father, Henry II. Richard was a central Christian commander during the Third Crusade, gaining victories against his Muslim counterpart, Saladin. He spoke very little English - his first language was Occitan and spent very little time (6 months over a period of 10 years) in his Kingdom, preferring to use it as a source of revenue to support his continental armies. In March 1199, Richard was in the Limousin suppressing a revolt by Viscount Aimar V of Limoges. He besieged the lightly armed castle of Chalus-Chabrol. When Richard was walking around the castle perimeter, without wearing his chain mail, while investigating the progress of sappers on the castle walls, a man who was standing on the walls aimed his crossbow at the king and an arrow struck him in the left shoulder near the neck... The wound became infected, then gangrenous and he died in the arms of his mother Eleanor of Aquitaine. as the second wife of King John from 1200 until John's death in 1216.
were probably destroyed during the French Revolution. Henry II (5 March 1133 – 6 July 1189), also known as Henry Curtmantle (French: Court-manteau), Henry FitzEmpress or Henry Plantagenet, ruled as Count of Anjou, Count of Maine, Duke of Normandy, Duke of Aquitaine, Count of Nantes, King of England (1154–89) and Lord of Ireland; at various times, he also controlled Wales, Scotland and Brittany. Henry was the son of Geoffrey of Anjou and Matilda, daughter of Henry I of England. He became actively involved by the age of 14 in his mother's efforts to claim the throne of England, then occupied by Stephen of Blois, and was made Duke of Normandy at 17. He inherited Anjou in 1151 and shortly afterwards married Eleanor of Aquitaine, whose marriage to Louis VII of France had recently been annulled. Henry was an energetic and sometimes ruthless ruler. By 1172, he controlled England, large parts of Wales, the eastern half of Ireland and the western half of France. He was the first of the House of Plantagenet to rule England. Henry and Eleanor had eight children. His legitimate children, chroniclers record him saying, were "the real bastards". He retreated to Chinon in Anjou, where he died while suffering from a bleeding ulcer in 1189. Richard, Henry's oldest living son, was crowned Richard I of England on 01Sep1189. Eleanor of Aquitaine (French: Aliénor/Éléonore; 1122 or 1124 – 01Apr1204) was one of the wealthiest and most powerful women in western Europe during the High Middle Ages. She became Duchess of Aquitaine in her own right while she was still a child, then later Queen consort of France (1137–1152) and of England (1154–1189). Eleanor married King Louis VII of France. As Queen of France, she participated in the unsuccessful Second Crusade. Soon after, Eleanor sought an annulment of her marriage, but her request was rejected by Pope Eugene III. However, after the birth of her second daughter Alix, Louis agreed to an annulment in consideration of her failure to bear a son after fifteen years of marriage. As soon as the annulment was granted, Eleanor became engaged to Henry, Duke of Normandy, who became King Henry II of England in 1154 and were married 18May1152. Over the next 13 years, she bore Henry eight children: five sons, three of whom would become kings; and three daughters. However, Henry and Eleanor eventually became estranged. Henry imprisoned her in 1173 for supporting her son Henry's revolt against her husband, and she was not released until 1189 when Henry died (on 6 July), and their son ascended the English throne as Richard I.
Eleanor acted as regent while Richard went on the Third Crusade where he was captured and held prisoner. Eleanor lived well into the reign of her youngest son John. She died in 1204 and her tomb effigy she is depicted reading a book, a mark of her great culture, the ability to read being exceptional for a layman and even more for a woman in an age when the church discouraged all learning! Jean Plaidy has written about her in several novels. 'Courts of Love' is written from a first person perspective in Plaidy's Queens of England series, and in The Plantagenet Saga, Eleanor of Aquitaine is featured in 'The Plantagenet Prelude', 'Revolt of the Eaglets', 'The Heart of the Lion', and 'Prince of Darkness'. Henry II, King of England, Count of Anjou . Today a stone effigy of the King lies in the nave of the Abbey church at Fontevraud. Eleanor of Aquitaine, Duchess of Aquitaine, wife of Henry II, Queen of England and sometime Queen of France. Today a stone effigy of the Queen lies in the nave of the Abbey church at Fontevraud. Richard I, King of England, Duke of Aquitaine, Count of Poitou, son of Henry II and Eleanor. Richard had quarelled with his father but repented on his way to Fontevraud for his father's burial and asked to be buried at the same place when his time came. He was intererred here in April 1199 just three months before his sister Jeanne. His effigy lies at the feet of his father's. John, King of England, son of Henry II and Eleanor, whose heart was brought here for burial. Isabelle of Angouleme, queen of England, wife of King John and Mother of Henry III , who became a nun here before her death. Henry III, King of England (son of John and Isabelle) whose heart was brought here for burial. 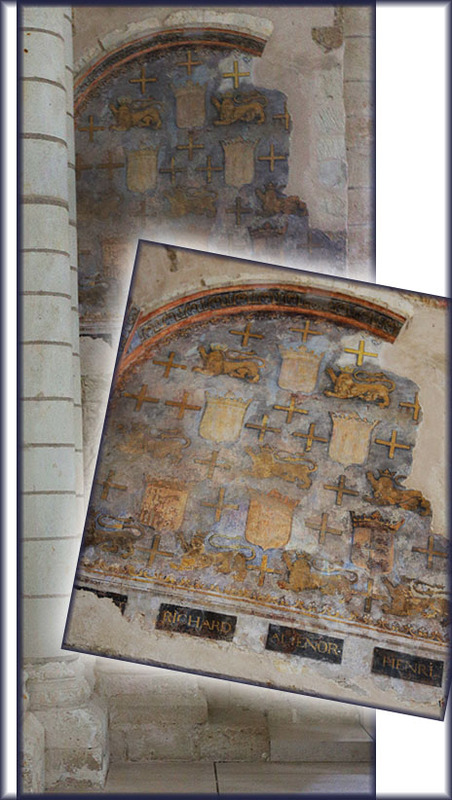 Jeanne (Joan) of England, daughter of Henry II and Eleanor, wife of Raymond VI of Toulouse, mother of Raymond VII, Count of Toulouse who was buried here in July 1199 along with her father and brother Richard. Before her death she had become a nun at Fontevraud. Richard, son of Raymond VI and Jeanne, grandson of Henry II and Eleanor, brother of Raymond VII (and nephew of the Lionheart after whom he was named) who died in infancy. The cloisters, here seen featuring an art exhibition. We are here entering a hall which I found the most captivating; note the detail in this doorway. Inside the hall of the monastery were lovely frescoes. It is also rewarding to be humble and look down. Robert of Arbrissel declared that the leader of the order should always be a woman and appointed Petronille de Chemillé as the first abbess. She was succeeded by Matilda of Anjou, the aunt of Henry II of England. This was the start of a position that attracted many rich and noble abbesses over the years, including members of the French Bourbon royal family. It also became a refuge for battered women and penitent prostitutes, and housed a leper hospital and a home for aged religious. During the French Revolution, the order was dissolved. The last abbess, Madame d'Antin, died in poverty in Paris. On 17Aug1792, a Revolutionary decree ordered evacuation of all monasteries, to be completed by 01Oct1792. The abbey later became a prison from 1804 to 1963. We come here to a remarkable building. It was deduced to be a kitchen. in his lifetime Henry seems always to have used his two lions as Count of Anjou. During the French Revolution, the order of Fontevraud was dissolved. On 17 August 1792, a Revolutionary decree ordered the evacuation of all monasteries by 1 October of the same year. The last abbess, one Madame d'Antin later died in poverty in Paris. The abbey became a prison from 1804 to 1963, including the war years. The plaque on the right reads "In this abbey, converted into a prison, members of the Resistance were incarcerated from 1940 to 1944 for fighting against Nazism. 14 died of ill treatment, 10 were shot and hundreds deported to concentration camps experienced the horror of Nazi barbarism. Do not forget them". In 1963 the abbey was given to the French Ministry of Culture.